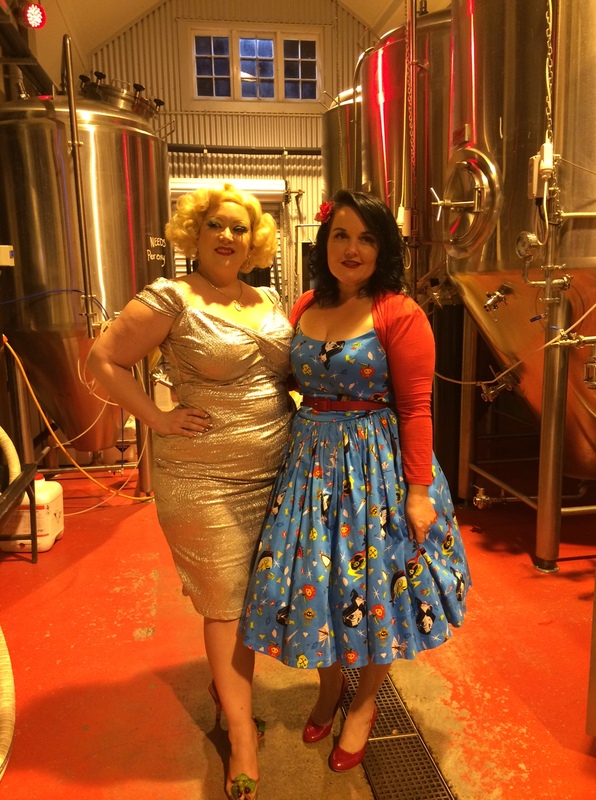 Here I am with the one and only Dirty Martini … wearing my PUG Jenny dress, flowers in my hair, eyeliner flicks, red lipstick, red patent heels … and DIRTY BLOODY MARTINI! A beautiful dress – be it wiggle or be it swing; wearing a dress to me, is the quickest way to feel flirty and feminine! And don’t forget, a sassy skirt can be just as good – especially with a nice, fluffy petticoat to “boof” it out! I am super in love with Pinup Girl Clothing Jenny dresses at the moment. Wearing flowers in my hair – big, small, clashing colours, complimentary colours, patterns – I don’t care; they’re all pretty. I’m also very partial to sparkly things in my hair. A cute cardie – let’s face it, unless you’re under 20, your arms may not be your best feature. Cardies add some sass to your look and cover up the not-so-good bits, so you can focus all the attention on what you love about yourself! A good red lipstick – it can be kinda high-maintenance, but it makes you feel so glam! Try Limecrime Velvetine in Red Velvet for an almost-impossible-to-budge pout, or Natio Rush as a cheaper alternative. Also Besame Red Hot Red – gorgeous. High heels – they don’t have to be too high ‘cos you want them to be walkable and wearable, but a stylish heel gives you a wiggle in your walk, and a giggle in your talk! Betsey Johnson earrings – I said this is MumptyStyle for ME didn’t I?! I love Betsey Johnson earrings with a PASSION, and at last count, had nine pairs plus three necklaces and two bracelets! They’re funky and fun – what’s not to love?! And now I have a new love … Erstwilder. Soooo gorgeous – my little collection is growing! Gorgeous handbags – this is another of my passions. I have a pretty decent-sized collection of handbags and can generally find one to match all outfits and suit all occasions. Having said that, I only buy one brand (I’m a loyal little thing at heart!) so I sometimes have to admire other brands from afar! Eyeliner flicks – they take practice and you can’t always rely on them when you’re in a hurry (have you ever heard the saying “never ask a girl with eyeliner flicks why she’s late”?!) but they are such a great look. Sometimes they can be tricky for us more “mature” pinups with ever-so-slightly hooded eyes (!) so I am currently researching ways to get around this – stay tuned! And last but not least ... a great big smile, because as Audrey Hepburn once said: “Happy girls are the prettiest girls.” Well said Audrey!